The Japanese electronics stalwart manufacturer Sony has lined up quite a number of Android based phones after its break up with Ericsson. The market although seems to be not so warm to a few of them but given their cost and efficiency factors, they are still quite a favorite. Topping the list of all Android offerings is the company's flagship handset called Sony Experia Z, it's water resistant and dust proof mobile phone that can survive being under 1 metre water for about 30 minutes. Released in March 2013 this new entrant android phone weighs 146 gms and is loaded with the Android 4.1.2 Jelly Bean with Xperia user interface. It is powered by the quad-core processor by Snapdragon S4 chipset with 1.5 GHz Krait 200 cores and Adreno 320 GPU. It also comes with 2 GB of RAM, 16 GB of internal storage (with microSD card support) and a 5" Thin-Film Transistor display with HD resolution. It also has the signature Sony camera fittings of 13 MP HD cameras with HD video recording capabilities. before Xperia Z, Sony Xperia T holds the flagship claim for Sony in 2012. It has a 4.6" HD display unit with 443 ppi backed by its signature bravia engine. The latest snapdragon 1.5 GHz dual CPU makes the mobile phone swift and efficient too. It also has the finesse of Sony's camera fittings to bring in the best photos and video possible from its 13 MP HD camera and 1080p HD video. Easy sharing enabled through NFC Android features gives it a favorable point by even critics. The phone that was released in December 2012, is still going strong as per market reports and is one of Sony's bet ever Android phone yet to be released. 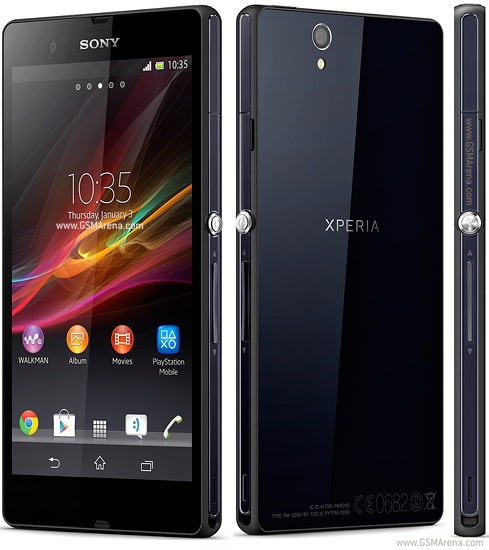 The Sony Xperia TL superbly sleek phone calls for applause from the company's efforts. It is a 4G LTE based on the Android platform with the best HD screen and capturing details. Its 13 MP camera and video specifications are similar to the Xperia Z and are seen to be working best even in low light. Powered with signature Bravia engine and a 4.6 " display unit. It also takes after the award winning Xperia Arc and ends up with a very sophisticated yet minimalistic arched body curve weighing only at 139 gms. The TL's NFC connectivity makes it also an friendly model with easy sharing of photos, videos and audios with your friends and family. It has a unmatched speedy interface powered with Qualcomm Snapdragon S4 Plus MSM8960 Krait CPU. Released in January 2013, this model by Sony got all the usual features as in the Sony Xperia Z with some more added features like a wider 5" display unit with 441 ppi and camera fittings that in itself is a class apart as usual. It also packs in a load of useful or not so useful apps with an Android 4.1 Jelly Bean. The compact smartphone weighs bit heavier than its predecessor of the Z model at 151 gms. It offers superb connectivity of 4G LTE or HSPA. It also offers battery capacity of 2370 mAh and around 10 hours of talktime. Unlike Xperia Z however it has a full touch screen keypad. One of the most pocket friendly android based smartphones around, the Sony Xperia Go weighs only 110 gms, has a display unit of 3.5 ", a 5 MP camera with 720p video resolutions. It is powered with Android 4.0 and is a more relaxing phone to have around when working in rugged surroundings of dust and water. With a 4.3 " screen space, a 13 MP camera and an Android 4.1 operating system, this model of Sony which was released on December 2012, packs in it an average android smartphone features with exceptional camera detailing and and 4G LTE connectivity. It has a full Qwerty keypad and offers a talktime of 7 hours with 1750 mAh battery capacity. Made of scratch resistant glass the phone has the usual Sony fare of Multi touch and proximity sensor features too. One of the cheapest of the Android based Xperia series of Sony, the Tipo runs on 800 MHz Qualcomm scorpion CPU and has an almost lag free Internet Connection Sharing inspite of being a low end model . It has a minimum resolution 3 MP camera with 3.5 " thin-film transistor screen. Offers a depressing talktime of 5 hours with 1500 mAh battery and weighs ligher than any other smartphones at 99 gms. It comes with Sony's usual Timescape user interface, proximity sensor, multi-touch and tough resistance glass. These variants of the Sony's Android offerings only goes to prove that although not leading teh Android market but Sony is also not far behind in the race. From time to time It has only taken strong steps to incorporate the latest mobile processor technologies and bolster its foothold in this market.